Ferber’s earliest works were directly carved figures in wood or stone. According to E.C. Goossen, the artist’s prewar years were inspired by his contact with Aztec and Mayan carvings in Mexico as well as his time spent visiting the Romanesque cathedrals of southern France. Avenging Angel II (1940–41), although resembling Ferber’s earlier body of work, presents the end of the artist’s figural work and the beginning of the abstract period for which he is more widely known. Avenging Angel II is composed several wood pieces doweled together to allow for the forward thrust of this wall-mounted sculpture. Ferber’s figure, like the sculptor, struggles to be free of gravitational bonds, a metaphor that would be explored even more subtly in his abstract works of the ensuing decades. Throughout his career he was an active member of the artistic community. Having participated in the First American Artists’ Congress in 1936, Ferber founded a splinter group, the Federation of Modern Painters and Sculptors, with Meyer Schapiro, Adolph Gottlieb, Mark Rothko, Ilya Bolotowsky, Bradley Walker Tomlin, David Smith and others. A few years later, in 1941, he was elected to the executive board of the Sculptors’ Guild with Chaim Gross, Robert Laurent and Hugo Robus. These various interactions with other modernist sculptors had a profound impact on his work in the years that followed. Around 1945 Ferber’s style began transforming. 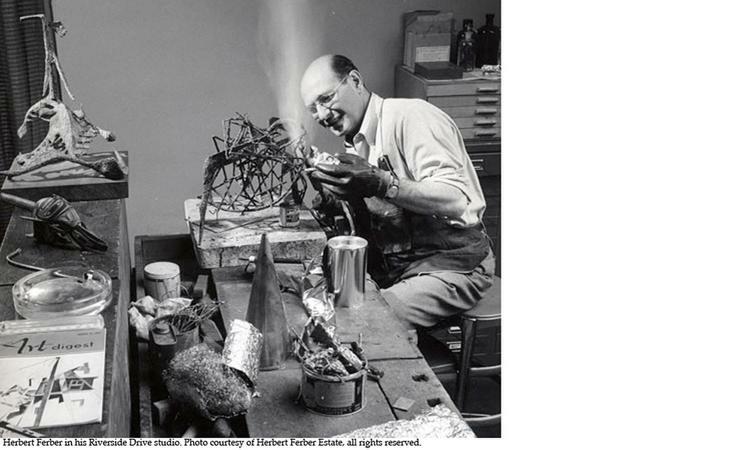 Using a gas torch hooked up to his kitchen stove to solder metals together, he started creating abstract compositions that increasingly departed from the figure. By 1949 he was using a blowtorch and had abandoned the figure entirely. Not exactly pure abstraction, these works seem to begin with familiar forms that are then manipulated into almost unrecognizable compositions. The Bow (1950) was among the first of these sculptures. Metal shards jut out in all directions, piercing the space the composition inhabits in a way that anticipates Ferber’s exploration into sculpture as environment in the 1960s. In a sense Ferber had always been an art historian. Throughout his career his work reflected not only a deep knowledge of, but also a reverence for the Old Masters. Like Michelangelo, who repeatedly saw his work in marble as “freeing the figure from the block,” Ferber’s earliest figures emerge directly from the medium, and eventually seek freedom from gravity, as in Avenging Angel II. This idea of breaking free—from gravity, from the medium, from space—continued to dominate Ferber’s work even after he had transitioned out of direct carving and into abstract welded works. Among Ferber’s most known works are the “caged” sculptures that make up his Homage to Piranesi series. In each of these sculptures a metal frame struggles, unsuccessfully, to restrain its contents. Although not expressed outright, we can assume that these ‘prisons’ are homages to Giovanni Battista Piranesi’s series of Carceri d’invenzione. A series of sixteen prints begun in 1745 that depict imaginary subterranean vaults filled with winding staircases and fantastical machines, Piranesi’s series bore a large influence on the Romantic artists and the Surrealists. Like Piranesi’s Carceri VII (conventionally, The Drawbridge), Ferber’s Homage to Piranesi VII (1970) is defined by a stark contrast between sweeping curvilinear forms and sharp edges encased within a frame that is seemingly unfit to contain its dynamic contents. Although Ferber is said to have abandoned his Surrealist tendencies around 1950 in favor of a purely formal vocabulary, his allusion to Piranesi and his Carceri suggests that Ferber had not entirely abandoned his propensity for Surrealism. From the 1970s onward, Ferber continued to produce abstract sculptures on a large-scale, primarily for installation outdoors. He passed away in 1991 in North Egremont, Massachusetts at the age of 85, leaving a vast body of work that today can be found in a number museums throughout the United States including the Cantor Arts Center in Palo Alto, California, the Dallas Museum of Art in Texas, the Pennsylvania Academy of Fine Arts in Philadelphia, the Jewish Museum in New York, and many others.